I'm on the Oxford exchange, which had FTTC delayed a few times, but is now showing on the OpenReach List as accepting orders. When I use the BT adsl checker, with either my phone number or address, it makes no mention of WBC FTTC Broadband at all. (The postcode checker does say I should get 39.1 downstream). 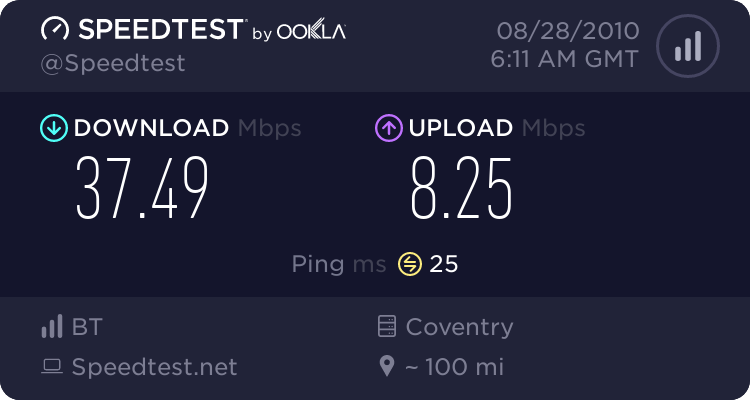 When I use the address checker with other addresses on my (100m long) road, it says they can all get FTTC at speeds in the 38-39 downstream range. I've tried the phone number checked with a few numbers I know for other people on my road, and for all of them it gives the same answer as the address checker, i.e. FTTC is available. With address checks, I've tried both sides of the street, and places at various points along it, they all (apart for me) are listed as FTTC available. It would appear that BT have a broken database, and have neglected to list me when they did the rest of the street. Is that likely, or are there other reasons why someone might miss out when the rest of the street is FTTC enabled? Do you currently pay line rental to BT, or has you line been taken over by another supplier? A few people have been caught out when their line was transferred to Sky or TalkTalk, where the number no longer returns data for the number. One street can be supplied by two cabinets - one enabled, the other not, creating the scenario you describe. Some site posters have a copy of BT's rollout database, so if you posted up your postcode, or at least the first part of it, I/they could have a look for you at that area and see if the theory above might hold true. Perhaps the best bet is to ring the provider you'd be going with and ask them to check availability. They seemed to think that the BT database was the word of god, and were generally not very helpful. This is possibly a sign that I'd need to switch to a different provider as part of an ADSL2 -> FTTC move! That postcode area is served by 158 cabinets, so the full list is too long to paste in. About half (81) are scheduled to receive a service and there are no plans for the others. If the original document is still online somewhere (I have it locally) maybe someone can paste a link. Check your PMs - the flashing icon on the menu bar. Remember that only around 60 ISPs are involved in FTTC currently, and many only on a trial basis. Suggest you check whether your existing ISP offers FTTC before asking them questions about availability!